Inspired somewhat by this post on naming characters I thought I would tell you all about my recent adventure with naming Storybook Perfect’s protagonist. Wait a sec you say, didn’t I finish writing Storybook Perfect ages ago – that’s the completed manuscript, right? So why are you naming the character now? I had originally named the character Yui right from the start. She was of Japanese/Australian descent with an Aussie father and a Japanese mother. When she turned eighteen she took her mother’s maiden name as her last name in honour of her deceased mother, so she has an entirely Japanese name. Originally Yui was Yui Horiba, but recently it occurred to me for authenticities sake I would need to know her name meaning and the kanji she used for her name. For those unfamiliar with the Japanese written language there is the Hiragana(for words of Japanese origin) and Katakana(for words of foreign origin) which are similar to the letters of our alphabet only they cover ‘mora’(syllables) such as ‘ka’, ‘tsu’, ‘ni’ ect. Then they make it really hard by having Kanji. In a nutshell kanji originated from China and are a large and (often)complex symbol which stands for a word or phrase. Most Japanese children are not fully aware of all the kanji so in many books and manga when a kanji is used the hiragana are written small alongside it so it can be spelled out easily. Most Japanese names have a special kanji attributed to them. 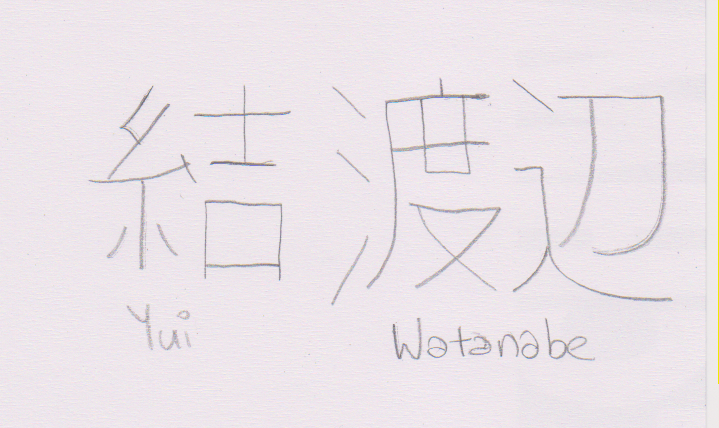 I realised I had a serious character flaw in the fact I had no idea what Yui’s kanji or meaning were so I studied up. I had a dreadful time trying to find the meaning for Horiba – which admittedly was a random Japanese surname that the younger me saw and thought ‘oooh, that sounds cool’ – and eventually came to the decision I might have to drop that last name and pick another. So I thought it best to start with Yui’s first name. I was fairly certain I didn’t want to change that, but if there was no last name I could match with it and be happy about I might be forced to so I didn’t say never. Yui’s name has multiple meanings depending on the kanji (as with most names). Meanings ranged from tie/link, only and reason and most of those could or were teamed up with the kanji for robe/clothing. With this range of meanings in mind I read through lists of last names and their meanings. I found a brilliant match almost immediately (It’s enough to make you believe in destiny!) in the surname Watanabe. True Watanabe is almost the Japanese equivalent of Smith, but when you hear what the combination of kanji can read as you will see why I chose it for a protagonist who travels from one dimension to another. as tie/link across boundaries/areas. You’ve got to appreciate that and (not to be too spoiler-tastic with my own book) you learn something more in book 2 about how powerful a meaning that name is for her. Of course I’m still a little paranoid, I’m only a beginner at Japanese and most of my research on names and kanji has been on the internet (where everything HAS to be true. Right?) so my translation may not be perfect. I’m hoping I might be fortunate enough that someone out there more skilled than I might be able to confirm I have it all right (You’d know someone, wouldn’t you Sammy?). Out of interest does anyone out there have an interesting name meaning, either for themselves or a character they created? Lastly I hope I didn’t offend any Japanese people in my descriptions I was decsribing what I knew in the simplest way possible and meant no insult if I made any.